to the message of salvation. proclaimed to the ends of the earth. $5 Will enable a missionary to distribute a Bible, Christian books, posters, children's Bibles, teaching and study guides and tapes of Christian music in the language of the people they reach. $15 Will help one needy child. Even many children who live with their own parents go hungry, wear rags, and don't go to school because their parent are unable to find work. Your kindness may result in the child and the whole family turning to Christ. $20 - $50 Will provide food, clothing, and shelter to street children through outreach programs and Soup Kitchens. Many children wander the streets looking for scraps of food. Most suffer from malnutrition. Many are abused. Sometimes their fate is much worse. $100 Will provide food, clothing and shelter to an orphanage. The aid sent by sponsors enables these children to have vitamins, current school books, Christian literature, and as a special treat the orphanage would have money for treats such as shampoo or even candy. 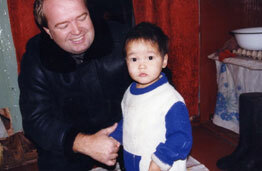 $200 Will support a full-time indigenous Russian missionary for a month. Missionaries know that the Lord supplies their needs; however, people like you are God's helpers here on earth. Your gift will support ministry and living expenses for one month. 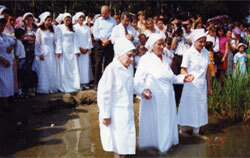 $1,000 Will bring an evangelistic crusade to a Russian village or town. $5,000 Plant a church. This amount will cover all initial costs to plant a church.